BioCeraMAX 1200 is a unique contribution designed for biological water filtration in freshwater and marine aquariums, paludariums, aquaterrariums and terrarium pools. It is in the form of rolls made of fine-grained sintered glass ensuring an extremely large filtering surface – 1200 m2. How does BioCeraMAX 1200 work? On the inside surface of the pores of the BioCeraMAX 1200 rolls placed in the aquarium filter over time, strains of useful nitrifying bacteria from the genera Nitrosomonas and Nitrospira are being settled. These microorganisms use metabolic products: ammonia (Nitrosomonas) and nitrites (Nitrospira) toxic to fish in their life processes. Nitrifying bacteria oxidize ammonia and nitrite to form nitrates, which are much safer for the inhabitants of the aquarium. Where and when does the BioCeraMAX 1200 work? BioCeraMAX 1200 is perfectly suited as a filter bed in canister filters, overflow filters, internal filters with chambers for loose powders (eg TURBOFILTER), sumps, filter chimneys. It can be used in both freshwater and marine aquariums. It is especially recommended for tanks with large fish and lots of fish. How should I use BioCeraMAX 1200? BioCeraMAX 1200 is immediately ready for use and does not require rinsing or any other additional activities. The contents of the packaging should be poured into the filter basket or the filtration chamber. In order to ensure optimal results, it is recommended to place the BioCeraMAX 1200 cartridge behind the mechanical filtration cartridges and before the chemical filtration cartridges. One package, i.e. 1 liter of BioCeraMAX 1200, is recommended for AQUAEL filters: UNIMAX 150, UNIMAX 250, MIDIKANI 800, MINIKANI 80, MINIKANI 120, ASAP and VERSAMAX. 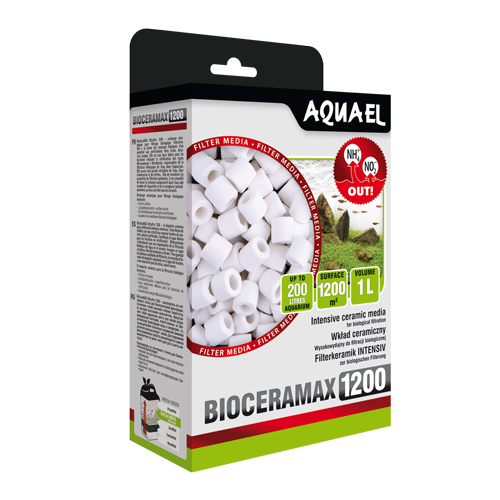 In the case of other filters, one BioCeraMAX 1200 package is recommended for the aquarium of approx. 250 l capacity. How long does BioCeraMAX 1200 work? The BioCeraMAX 1200 cartridge can be used for a very long time without replacing it, however, it is subject to slow, gradual wear due to crushing, which reduces its effectiveness. In order to ensure an optimal effect, it is recommended to replace about one-third of the contribution for a new one every 6-12 months. When cleaning the filter, the cartridge should be rinsed in the water drained from the aquarium. Do not wash the BioCeraMAX 1200 in tap water to prevent its sterilization.